EMDA – a/k/a Enterprise Management Data & Analytics – is Sage’s Enterprise Management (formerly X3)-specific edition of ZAP Data Hub and a flagship BI, data management and analytics tool for EM users around the world. Enterprise Management Data & Analytics empowers your business with the information you need to confidently make decisions that improve performance. Guide your corporate strategy, direction, and investment decisions with data, facts, and truth—without hesitation. Enterprise Management Data & Analytics places data-based decision-making at the heart of your business. Grow your organization by applying successful data management and analytics tools, strategies, and methodologies to all business functions. Get powerful, flexible data management with a solution that’s built ready for cloud deployment, on-premise, or a hybrid of the two. With Enterprise Management Data & Analytics, you have a governed, secure, and legislatively-compliant means of drawing business insight from Enterprise Management, as well as other applications and data sources. 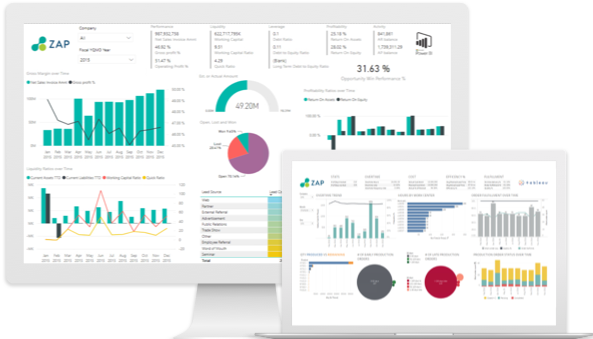 Enterprise Management Data & Analytics is pre-packaged with powerful, self-service reporting tools, analytics, and role-based dashboards. Improve collaboration and consistency with reusable ratios, metrics, calculations, and charts. Plus, you can use all these dynamic elements on any mobile device. Simplifying complex data challenges, EMDA supports all versions of Enterprise Management (formerly known as Sage X3) from version 6.5 onwards. This enables you to implement the software in various ways, including stand-alone, as a module of EM, or within a wider ecosystem of integrated business applications. What’s new in EMDA 8.1? Added support for Enterprise Management v12… Updated Sage EM data source and ability to extract non-LDAP Syracuse users (from the SData/API1 service)… Dynamic security support not only based on ‘Function’ profiles but also ‘Trade’ profiles. Drill-across/drill-through enhancements (adds slicers in target resources for an improved data exploration/navigation experience between analytics)… New and updated color palettes… Updated home page now includes more self-service training assets. History Step adds the ability to track changes in values and store versions of records in the data warehouse, for dimensions or transaction tables… New data sources for connecting to Marketo, Google Analytics, Magento, XML, JSON, Excel Online.